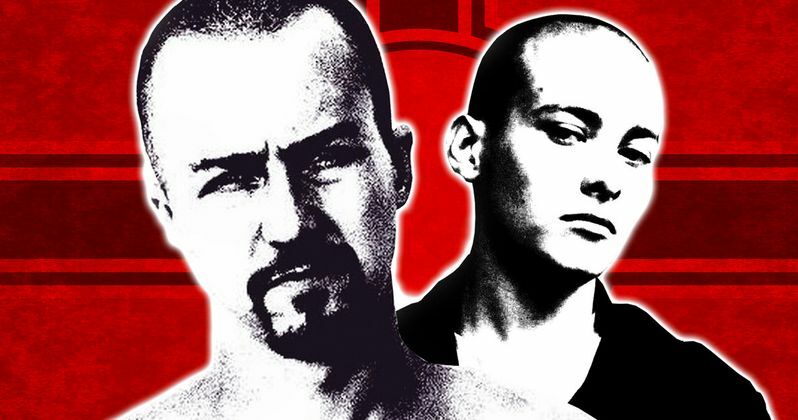 American History X, the moody drama about a pair of troubled brothers caught up in the Neo-Nazi skinhead movement, took an honest look at the underbelly of white supremacist counterculture in America, in many ways, presaging the state of the country 20 years after its release. Released in 1998, a year before Fight Club, American History X earned Edward Norton an Oscar nomination for Best Actor. Here we look at 10 things you never knew about American History X.
American History X was partially inspired by a true story. American History X marked the debut of screenwriter David McKenna, who went on to write another movie partly based on a true story, Blow, starring Johnny Depp. Real life former white supremacist skinhead Frank Meeink was arrested at age 17 and spent three years in prison, where he befriended several inmates of various ethnicities and grew to reject his former beliefs. He is now a writer and lecturer. Joaquin Phoenix turned down the lead role. Edward Norton was not the first choice for American History X. Joaquin Phoenix, a few years away from Gladiator, reportedly passed due to the movie's subject matter. When Norton was offered the starring role, he actually had to turn down a part in another movie, Saving Private Ryan, in which he would've played the title character. The director came from the world of music videos. British born director Tony Kaye hadn't made a feature film before American History X, making a name for himself first with a series of TV commercials and music videos. He was responsible for the clip for the Soul Asylum hit "Runaway Train." In the years since American History X, Kaye directed Red Hot Chili Peppers "Dani California" and "God's Gonna Cut You Down" for the late Johnny Cash, which included a small army of famous Cash acolytes, including Iggy Pop, Bono, Kanye West, Johnny Depp, Patricia Arquette, Sheryl Crow, Chris Rock, Keith Richards, the Dixie Chicks, and Woody Harrelson. The clip won a Grammy for Best Music Video. The director didn't want Edward Norton. First time director Tony Kaye reportedly wasn't consulted before the studio hired Edward Norton to play Derek Vinyard. "Edward is a fantastic actor. I think he's technically brilliant, but he doesn't have that physicality and anarchic emotion that was required for American History X," the director said in a 1998 interview. In 2002, Kaye confessed, "One advantage of having Edward was that we had a shared vision of how to improve the script. In casting him I was really buying another writer." Norton was super committed to the role. Norton, of course, was fantastic, gaining over 20 pounds of lean muscle mass for the part and ultimately earning an Academy Award nomination for Best Actor. As Kaye pointed out, he was also instrumental in refining the story. Eventually, he even found himself in the edit bay, overseeing what became the film's final theatrical cut.